As I've noted in previous reviews, QNAP NASes share a common operating system. The current operating system is QTS 4.3.4. Here's a link to a full description of the features of QTS 4.3.4. You can read or download a comprehensive brochure here and the full QTS 4.3.4 User guide can be found here. Of course, some of the features found in the high-performance NASes, such as real-time 4K video transcoding and virtualization won't be available on entry-level NASes such as the TS-128A series. Complete specifications for the TS-128A can be found here. QNAP has a live demo so that you can browse the QTS 4.3.4 interface. There is also a YouTube channel that hosts the QNAP College. There are videos covering hardware installation, initialization, setting up myQNAPcloud, Network Access protection and a tutorial on how to backup your Mac. The image below shows the control panel and was generated using the live demo. One of the new features of QTS 4.3.4 is block-based snapshots. Snapshots enable you to create recovery points with very little storage overhead. The image below shows a screenshot of the Snapshot Manager. Here's QNAP's comparison of their snapshot technology as compared to their competitors. The takeaway from this is that QNAP snapshots work on the majority of QNAP NASes - even entry-level models like the TS-128A. The Synology DS118 being compared in this review does not support snapshots as Synology only implements snapshots on NASes that support the BTRFS file system. The DS118 only supports EXT4. QTS Version 4.3.4.0486 firmware was loaded onto the TS-128A and performance tests were run using the Revision 5 NAS test process. All tests were run using a Western Digital Red 1 TB (WD10EFRX) (x1 SNB supplied). As noted in the introduction, the Realtek processors used in these two devices are different. However there is the same number of cores running at the same clock speed and the same amount of memory, so you might expect that the results would be similar. That said, the Synology DS118 outperforms the TS-128A on File Copy Read and Write tests as well as the NASPT File Copy To NAS/From NAS tests. In general, the DS118 results were slightly better for most tests. The TS-128A has USB 2.0 ports, so the backup results are shown. The DS118 only has USB ports, so you can compare those results directly. The TS-128A held a slight edge over the DS118 for USB 3.0 FAT backup as well as the Network backup test, but the DS118 was faster for all of the rest of the backup tests, as well as the iSCSI Read and Write tests. Note: For the backup tests on the TS-128A, we had to use the Hybrid Backup Sync app with a one-way sync job for the rsync test. The remote backup option works only with other QNAP NASes. Comparing the NAS Ranker performance summaries for the TS-128A and DS118 shows the DS118 ranked #1 in all categories with the exception of Backup. However, drilling down into the backup scores, the DS118 had a #1 ranking for its USB 3.0 backup (108.88 MB/s) compared to the TS-128A (94.98 MB/s). However, the QNAP edged out the DS118 in the category because of USB 2.0 score and the slightly faster rsync performance. We continue to recommend purchasing a 2-bay (minimum) NAS for the fault tolerance RAID 1 can provide. But if you're dead set on purchasing a single-bay NAS, the good news is you have two very good choices. Although the Synology DS118 is ranked #1 due to its slight performance advantage in many benchmarks, both NASes can make pretty good use of a gigabit Ethernet connection for large sequential file copies. 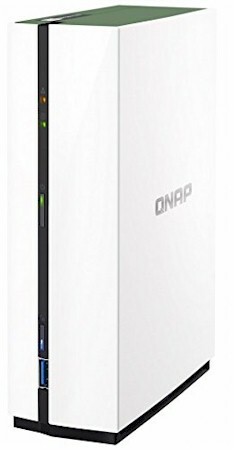 Since the Synology DS118 sells for $180 without offering any significant advantages over the $130 QNAP TS-128A, the QNAP would be my recommendation. It also offers backup snapshot protection normally found only on significantly more expensive NASes.